When a player logs into a Minecraft server, one of the first things they see are the colors and ranks of other people. Every server is different, but these ranks are usually obtained through donations on a server’s website, in-game progression, or a combination of both. Ranks are important for Minecraft servers because they reward people for investing time or money in your server. Minecraft server ranks usually come with unique names and perks. For example, perks could be access to special commands, the ability to fly, more land claims, and so on. These perks are often added through the use of plugins. Perks have to be rewarding enough to make it worth it for players to donate or invest time on your server. I recommend making the most “game changing” rewards only available through normal gameplay and the more cosmetic perks for donations. This will help make sure that your server follows Mojang’s EULA. Rank names should have a clear hierarchy and fit the theme of your server. 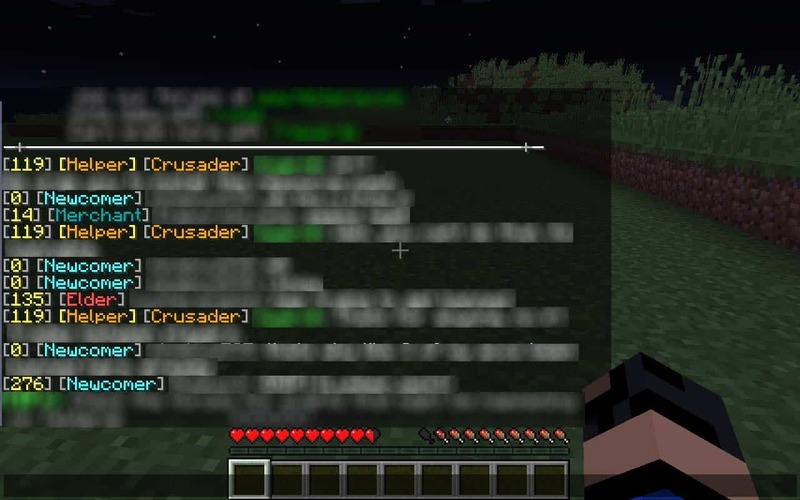 For example, in a medieval-themed server, the ranks could go peasant, squire, knight, and so on. In this example, a new player can easily guess that a “peasant” is a new player and a “knight” is a more veteran player. The colors should also fit the hierarchy, for example peasant could be white, squire could be grey, and knight could be dark grey. Admins and staff should have their own color or tag, usually dark red on most servers. Rank tags and custom colors can be added using a permissions plugin such as LuckPerms. Tip: You can add a “+” to any server rank to make another rank. For example, you could have a VIP and a VIP+ rank. Colors: White, Gray, Dark Gray, Yellow, Gold, Orange, Teal, Dark Blue, etc. Mobs: Zombie, Skeleton, Creeper, Witch, Enderman, etc. Animals: Chicken, Pig, Cow, Sheep, Horse, etc. Ores/Items: Dirt, Stone, Coal, Iron, Redstone, Gold, Emerald, Diamond, etc. Tip: Rank colors should go in a natural order. For example, start with whites and grays then move into more desirable colors like yellows and golds. In 2014, Mojang announced that rules around donation rewards were changing. The “EULA”, or End User License Agreement, was updated and servers are no longer allowed to offer game-changing ranks in exchange for real-life money. Mojang threatens legal action against Minecraft Servers which do not follow their new EULA. Most major servers have complied, and as a result donation ranks are now more cosmetic on many servers. It is enticing to allow players to pay for currency or diamonds and make more money, but doing so hurts regular players who may be unable to donate. Having run successful Minecraft servers in the past, I have found that a significant amount of people will donate for minor rewards if they love the server. Instead of focusing on making money by selling flight for $200, you should work hard on server advertising and making a good server for your players. Once you have a quality server and a large player-base, the money will roll in on its own. Login Effects: when a player logs in, a harmless (but impressive) lightning bolt will strike their location. This can also be done with fireworks! Trails and Particle Effects: players can toggle particle trails that follow them (for example, bubbles or flames). Hat plugins that allow players to put items on their head as a decoration. Pets that follow players around (on top of the normal tameable animals like parrots or llamas). Unique chat colors, tags, or rank names for donations. Ability to change chat color and colors on sign text in-game.